Mysteries of History: Our Fascination with Fireworks ~ The History Girl! Fireworks originated in China, more than two thousand years ago. The first forms of fireworks were nothing more than a green bamboo shoot called pao chuk (bursting bamboo). When heated in a fire, the air trapped inside the shoot expands quickly and explodes with a loud, aggressive kaboom. Although these early displays were not much to stare at, as they were mostly acoustical rather than visual, they awed the community during spiritual ceremonies for many years. The next example of modern fireworks was an accidental discovery of huo yao (fire chemical), known as gunpowder. In the ninth century, Chinese alchemists were working to improve on a recipe for toffee that if fashioned correctly, would bring never-ending life to whoever consumed the treat. Paradoxically, those who were not destroyed by the steeping kettle often died from eating it. The honey, sulfur, and saltpeter brew, when set alight would produce a crumbling black combination that burned rapidly over an open flame. The alchemists’ mixed this black residue with pao chuk and the first firecracker was created. An illustration of the Ruggieri fireworks show, which Handel scored with Music for the Royal Fireworks, 1749. Since the innovation of this black residue, fireworks have evolved significantly in manufacturing and technique. Paper tubes with fuses replaced the Bamboo stems. Where pao chuk was used to scare malevolence away, developing the firework was used to scare the opponent in combat. 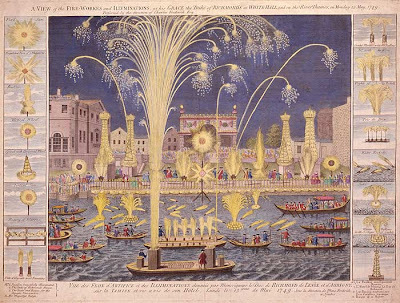 During the Renaissance era, fireworks became a skill, when artists such as sculptors and craftsmen worked together to create small replicas of castles decorated with fountains and wheels that would spew luminous sparks, or spin swiftly so that the spectator witnessed a impressive ring of fire suspended on top of the castle during a nighttime exhibit. Regardless of the advancements in how fireworks were fashioned, the only colors they produced were orange and bright white. During the1830s, advancements in chemistry brought the discovery of color which could be produced by burning metallic salt and chlorinated powder at the same time. Chemists used this discovery by putting it to the flame tests, which classified the new elements based on their exclusive emissions spectrum. Eventually, chemists began utilizing these components in their mixture, while other advancements were discovered, such as electrolysis. Electrolysis allowed the chemist to acquire magnesium and aluminum in its virginal forms. These two elements, when applied to colored fireworks, permitted them to burn even brighter. 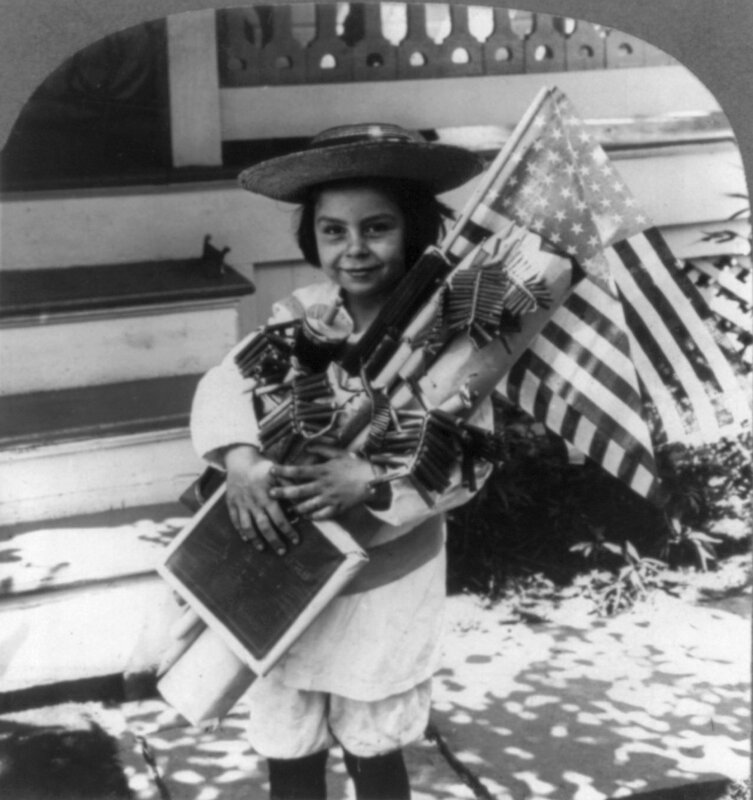 Fireworks were brought to the United States, by way of the Louisana Purchase and the citizens of the French quarter. They were used to deter the natives of any unwanted company. The first commemorative Independence Day fireworks display was set off on July 4, 1777. The Evening Post wrote that in Philadelphia, “The evening was closed with the ring of bells, and at night there was a grand exhibition of fireworks on the Commons, and the city was beautifully illuminated.” The paper noted, “Everything was conducted with the greatest order and decorum, and the face of joy and gladness was universal.” That same year in Boston, fireworks brightened the sky and Col. Thomas Crafts displayed the exhibit over Boston Common. By 1783, fireworks were available to the citizens, and in 1784, one Boston merchant offered a wide vriety of products, which included rockets, serpents, wheels, table rockets, cherry trees, and fountains. Young girl preparing for the 4th of July, 1906.